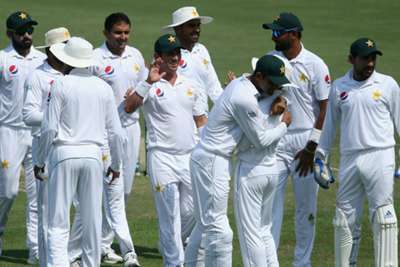 Pakistan bowled Australia all out for 145 – the last six wickets falling for just 70 runs – before establishing a 281-run lead by reaching stumps at 144-2 in their second innings. Abbas took two wickets at the end of day one in Abu Dhabi and claimed a further three to finish with figures of 5-33 – his best return in his 10th Test after a prolific start to his career in the longest format. Abbas struck the final blow by ending Mitchell Starc's (34) valiant knock and, despite the early loss of Mohammad Hafeez (6), Fakhar (66) became just the fourth Pakistan batsman to record a pair of half-centuries on debut.